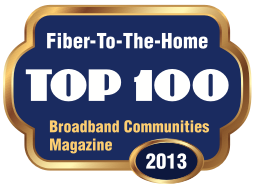 MuniNetworks reports on the success of the City of Palm Coast's FiberNET project. The all fiber City-owned network is operated as a multi-service, multi-provider open network, and is delivering substantial savings to both public and private entities and businesses connected to the network. The project is in the black, and FiberNET is expected to pay back all of the initial City investment in less than six years. Design Nine provided the network design, the financial planning, and the project management for the City of Palm Coast. Here is a short note from an entrepreneur and venture capitalist in Florida who really gets the importance of broadband. He lists four critical reasons why broadband is important. Businesses can't survive without affordable, high capacity broadband. Broadband is now essential to K12 schools and higher education. Healthcare providers are now often the biggest users of broadband in a community, so lack of affordable, high performance broadband increases the cost of healthcare and limits delivery of healthcare services. Broadband is good for the environment. Energy conservation, preservation of the environment (e.g. storm and run off water monitoring, water quality, etc. ), and energy management requires monitoring and connectivity. Here is a question for community leaders and planners: Look at the four categories listed above and ask this question: "Do we want a large telephone or cable company making the decision about what kind of infrastructure is available in our community for business, health care, education, and the environment?" The City of Palm Coast, Florida formally opened its high performance fiber network on Tuesday. Design Nine provided the early phase planning, financial and business modeling, network architecture design, vendor evaluation, and equipment and contractor procurement. The open access network opened with two service providers and several business customers on day one. Citywide WiFi projects in Sacramento, California and St. Cloud, Florida are both having problems, supporting my long-standing contention that these efforts are risky. MobilePro, the company that got a city government contract to blanket the city with WiFi, is pulling out of the project entirely after the company and the city could not agree on how to finance the project. What's mind-boggling is how the company and the city agreed to move forward without a clear understanding of how the system would be paid for. Unfortunately, this is typical of "knee jerk" broadband projects that are promoted vigorously to local leaders who don't really understand enough about how community broadband should be operated. And very few vendors do, either. Wireless vendors just want to sell hardware, and so they don't really care very much if a business model is weak or nonexistent. In St. Cloud, Florida, which got a lot of publicity when their citywide wireless effort was announced, is now having problems because they are finding out what some of us have known for a long time--WiFi is at best a bridge technology, not a long term solution. And you have to understand its limitations to make best use of it. The St. Cloud problems are largely technical ones at this time, with many residents not able to get a strong enough signal to use the free service. Residents are being advised by the City to buy a $170 signal booster. But many say they are going to stick with DSL. One of the problems with WiFi is that it is can be lumped in the same category as DSL and cable modem services--that is too say, not exactly a bridge to the future. If you already have DSL or cable modem service, switching to WiFi is not likely to bring any real improvement to throughput, and it might even be less capable. Consumers are price sensitive to a point, but at this time, many people already understand the value of broadband, and are willing to pay for it in return for adequate performance. What St. Cloud is finding out is that residents won't necessarily switch to a free service that does not perform up to their expectations. So the city's money may have been wasted. Broward County, in Florida (the Miami region), has been publishing all sorts of personal information on its citizens via the Web. They have been putting public documents online, but without redacting information like birth date and Social Security numbers. Broward County officials maintain they have been following state law that requires them to put public documents online--but state they do not have the statutory authority to take personal information out of the documents. That will change a year from now, as the legislature has finally passed a law that requires local government to redact the information before publishing it online. It is yet another example of clueless legislators--according to the article, local officials have been trying to get help with the problem for years. This demonstrates why education is at least as important as infrastructure when dealing with Knowledge Economy issues. Florida is synonymous with the space program, and Lockheed Martin's replacement for the space shuttle will be assembled and launched from Florida. The U.S. has not designed and built a new space vehicle in two decades, but the shuttles are nearly worn out. The new launch vehicle is a more traditional rocket design that will carry six crew to earth orbit. This is part of the plan to have two different vehicles to support the space program. One will carry crew to and from earth, and the other will stay in orbit and will be used for satellite repairs, space station support, and travel to and from the moon. The City of Orlando has pulled the plug on its ambitious free WiFi program. It was costing the city almost $2000/month, and only an average of 27 people a day were using the system. There are several things we can learn from this. As I've been saying for a long time, start small and make sure something works before pouring a lot of money into it. Orlando should have tried a few hotspots and kept the cost down to a few hundred dollars. If they had done this and monitored usage, it would have been a clue that usage was not what they expected. IT folks love big projects because it allows them to justify bigger budgets and more staff. Higher level managers (read elected officials, in this case) often allow themselves to get railroaded by their IT staff as IT folks throw around a lot of buzzwords and make everyone feel ignorant and behind the times. I don't know if this happened in this case, but think about the Philadelphia project, led by the city's IT director, that wanted to build a massive, multi-million dollar citywide WiFi system. It never made much sense to me--I don't ever recommend spending that much money in advance of understanding the market direction. And the market direction for WiFi has always been muddy. Beware of vendors promising big benefits. Vendors love muni projects because they can usually get muni IT staffs excited about buying a lot of stuff, and it is usually then easy to wow city leaders who are feeling some pressure to "do something about broadband." WiFi is only part of a comprehensive approach to broadband. Despite what vendors say, it does not solve the broadband "problem." So what should communities be doing about WiFi? I think that muni WiFi makes sense only when you understand what the bigger community goals are. Are you trying to get tourists to pull off the interstate and visit your community? Then a free WiFi hotspot at the tourist center makes a lot of sense, and is easily justified. Add Florida to the list of states with bills pending to stop municipal and local government investments in telecom. Across the country, legislators, prodded by the phone and cable companies, are trying to outlaw community investments in telecom. One of the problems is that the discussion is one-sided. There are few consumer and local government advocates getting involved in educating legislators about the benefits of local telecom investments. Barry Moline, head of the Florida Municipal Electric Association, summed up the debate from the community perspective. "Why should our communities' needs be based" on whether private companies will provide services?" One of the red herring arguments being tossed around by the incumbents is the notion that tax money is being used to support these projects. I've been invovled in designing business models for community telecom projects for years, and I've yet to see one that counted on one cent of tax dollars. I've never even heard anyone suggest, even casually, that tax dollars ought to be used. And finally, these simply can't be financed with tax dollars. It doesn't work, and elected leaders know that. Community telecom projects have to be designed from the ground up to be self-supporting, or they will fail. Services fees have to balance out with the cost of managing and maintaining the network. It's a complete fiction that tax dollars are being used to support these projects, and the incumbents know it. What's really sad is that these companies, instead of choosing to compete honestly and offer their customers the services they want, are instead refusing to provide those services and simultaneously trying to cut off the options of communities to get needed services.